The campaign is geared toward combating violence against black youths in the country. 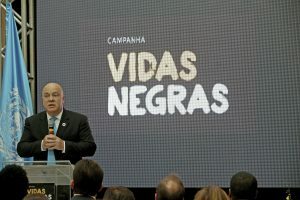 SÃO PAULO, BRAZIL – The office of the United Nations in Brazil launched this week the campaign ‘Vidas Negras’ (Black Lives), geared towards ending violence against black youths in the country. According to data, every twenty-three minutes a young black man is killed in Brazil. That is 66 lives lost per day and 4,290 deaths per year. U.N. representative launches campaign to combat violence against black youths in Brazil, photo by Wilson Dias/AgBr. “I reaffirm the commitment of the United Nations team in Brazil to eliminate racism and racial discrimination. The ‘Vidas Negras campaign is a call to action,” said United Nations resident coordinator Niky Fabiancic during the launch of the campaign earlier this week. It is unacceptable that the fact of being black puts young people at risk of being killed,” added the UN representative. According to Fabiancic Brazil is one of the 193 countries committed to Agenda 2030 for Sustainable Development and one of the key commitments of this agenda is to ‘leave no one behind in relation to sustainable development goals, including black youth’. “With the Vidas Negras campaign, the UN invites Brazilians to engage and promote actions that guarantee the future of young blacks,” concluded the UN representative. According to the Map of Violence released by the Latin American Social Sciences Institute (FLACSO) a black boy is up to twelve times more likely to be killed than a white man in Brazil and according to the UN what these murders have in common is the presence of racism. The objective of the campaign according to organizers is to sensitize society, public managers, the justice system, the private sector and social movements regarding the importance of policies to prevent and combat racial discrimination.